OCEANFRONT. 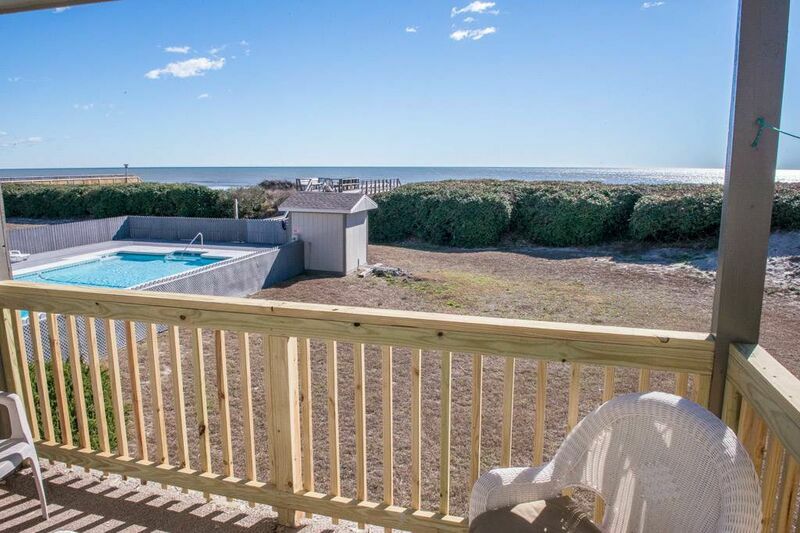 3 bedroom, 2 bath oceanfront condo accommodating 8. Private porch overlooking the beautiful Atlantic. Community pool close enough to watch the kids, but far enough to be out of the way. Amenities include large flat panel TV and DVD player in living room, flat panel in master, and small TV in bunk bed room, all with expanded cable. A touch of nostalgia with VCR built in to the TV in the kids room and a library of VHS tapes for the kids. Other amenities to make your stay more comfortable include Washer/Dryer, Dishwasher, wireless internet, (open May 1-Oct 15), and community grills. New HVAC system for your assured comfort. No smoking and no pets. Sleeps 8. 3BR/2BA. King, Queen, 2 Bunk Beds.